Smart Products Are Not Just For Us — They’re For Our Pets Too! By Aiza Coronado on 12/08/16 • Leave a comment! Come on humans, our fur babies only deserve the best! Let us not deprive them of the cool benefits of using smart products. When we think about it, they do need these things because: 1.) We leave them at home alone and sad on most days. 2.) They’re the superstars in our lives and we can’t bear to see them sad, don’t we? Why don’t you get your pets a little smart something this Christmas? Here are some cool pet gift ideas. Aside from keeping you connected with your dog during your lunch breaks at work, pet cameras like the Petzi Treat Cam can dispense treats to your pets when you’re away. Keep them happy and watch them catch the treats. Snap a photo for memories too. Surprised? See, it’s not only you who need Fitbit. Track your pet’s health and make sure that they get enough exercise by making them wear FitBark. You can easily share the data with your vet so you can keep them at their top shape. During playtime, I bet it’s you who always run out of breath first. Well, there are smart toys that can let your pets play to their hearts’ content! The Petcube comes with a laser pointer which you can program. Another one is iFetch; it lets your dog play catch the whole day if they want to. These toys are best if you want to keep your dogs active, but you lack the time to regularly walk or play with them. 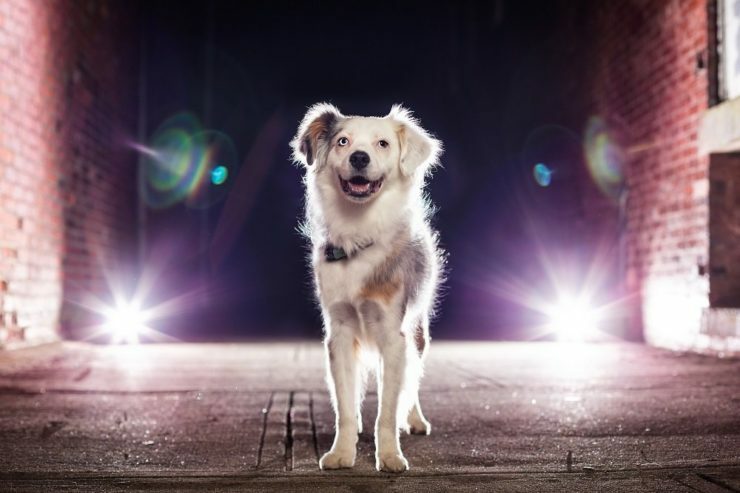 Give your pets any of these smart products and get a lick! By David Ponce on 11/03/16 • Leave a comment! 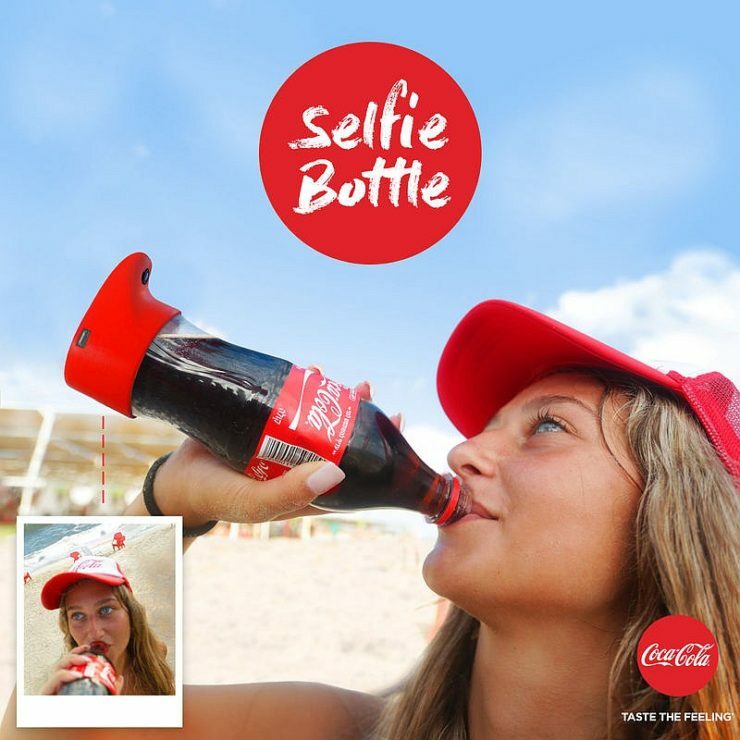 No, not even close to being a gadget. But it gave us a good laugh on a Thursday morning, so why not share it with you guys? 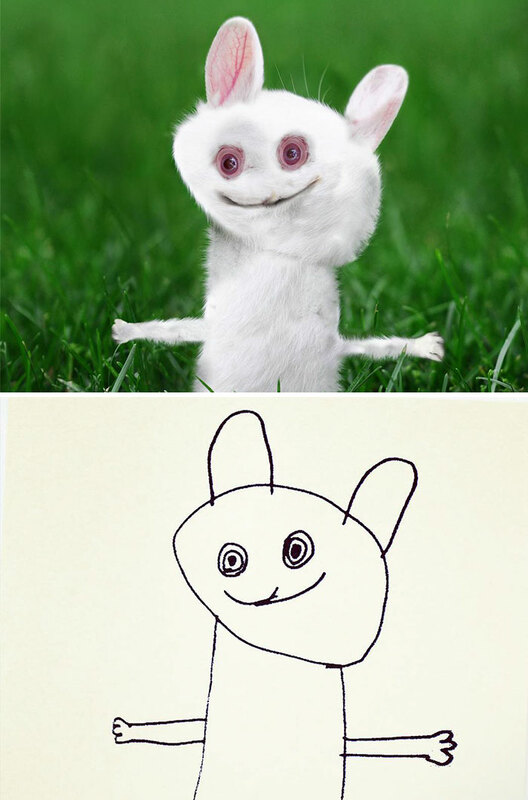 Below is a series of images that bring to life one lucky kid’s masterful art pieces. His name is Dom, he’s 6, he likes to draw, and he even has an Instagram account where he shares his life’s work. 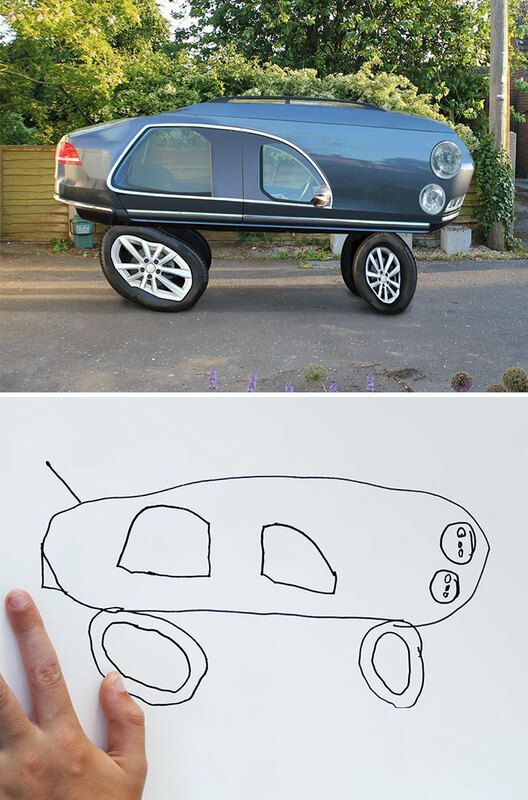 That’s cool enough as it is, but then his dad takes each drawing and through the magic of photoshop, recreates a “real life version” of the subject. 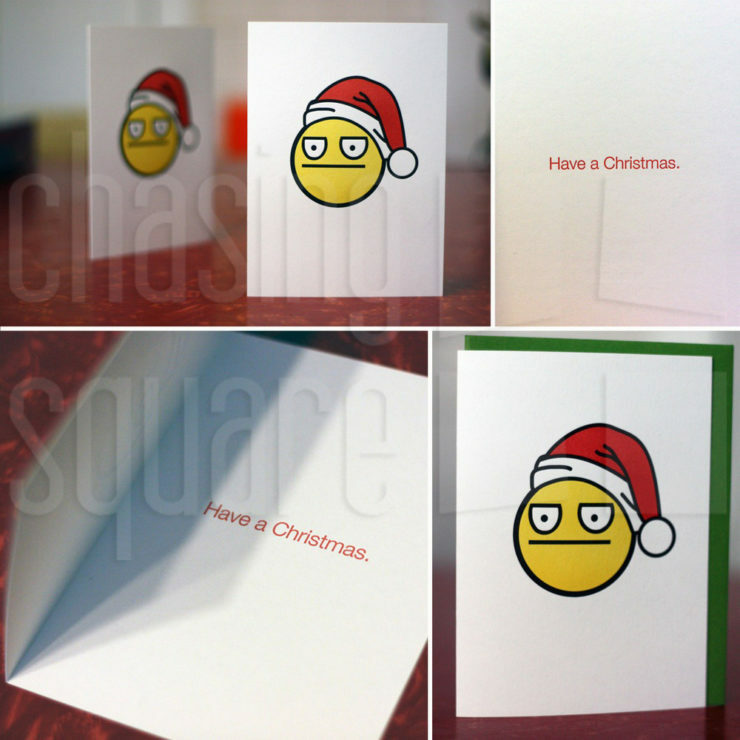 It’s creepy, it’s hilarious, and frankly we think it’s awesome. Hit the jump for a bunch more pictures. By David Ponce on 11/01/16 • Leave a comment! 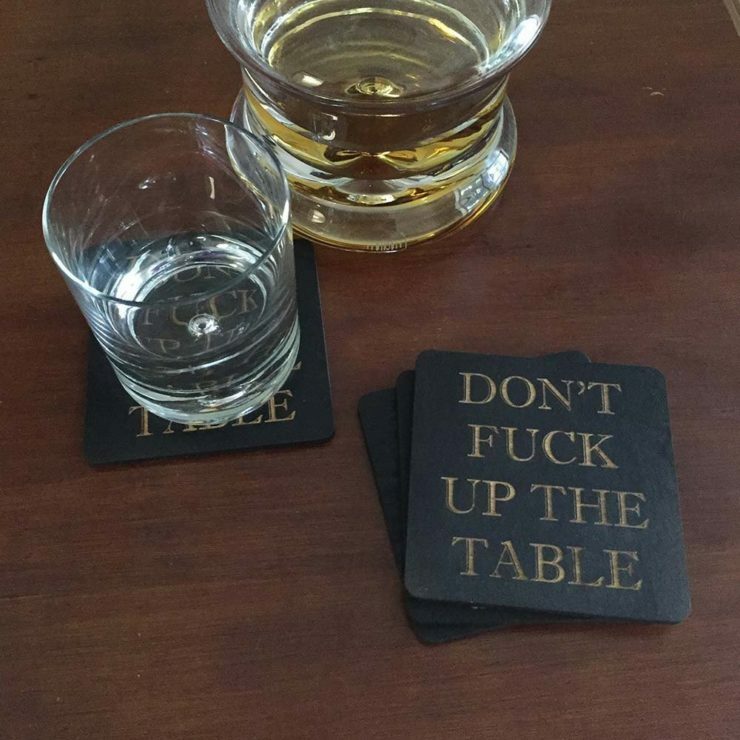 Serving drinks to your guests while using coasters says a lot about you. It says you value your expensive furniture, which is fine, but it also shows you can be a little uptight about things. Yes, you want to keep your expensive things looking expensive, but why did you have to get something so delicate to start with? Plus, tossing a coaster under your friends’ drinks also puts some pressure on them to keep using them; it’s sending a message. And just in case that message isn’t clear enough, these coasters right here spell it right out. 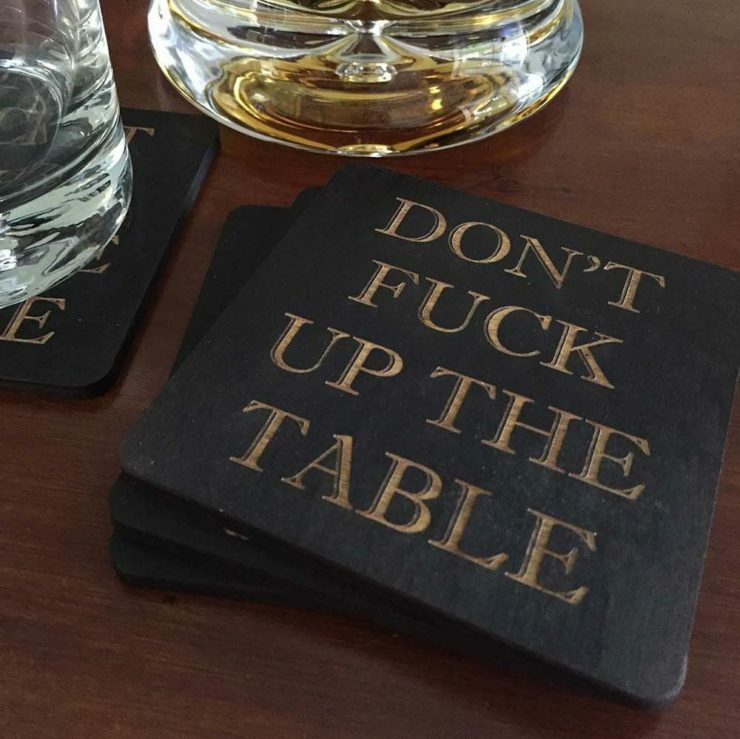 The “Don’t f**k up the Table” coasters are about as direct as you get, and their bluntness might actually take some of the tension away, putting a potentially slightly uncomfortable message front and center while making light of it, simultaneously. Or, of course, we could be overthinking the whole damn thing, and these are just cool conversation pieces. 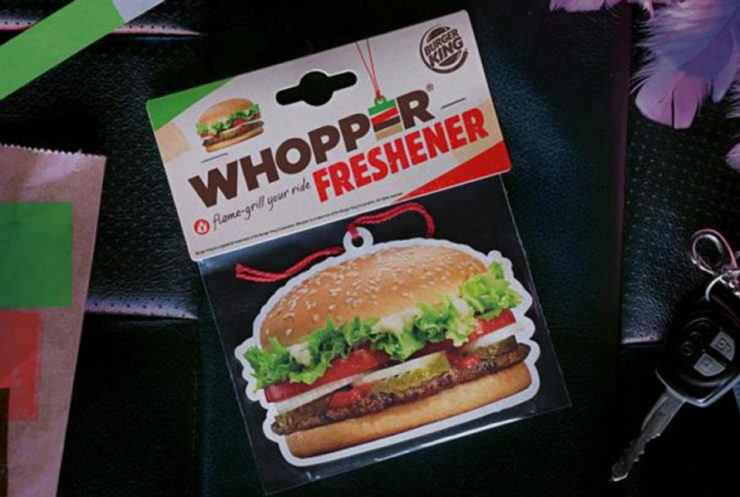 Whaichever way you want to see it, it’ll cost you $17 to own a set of 4. By David Ponce on 10/20/16 • Leave a comment! 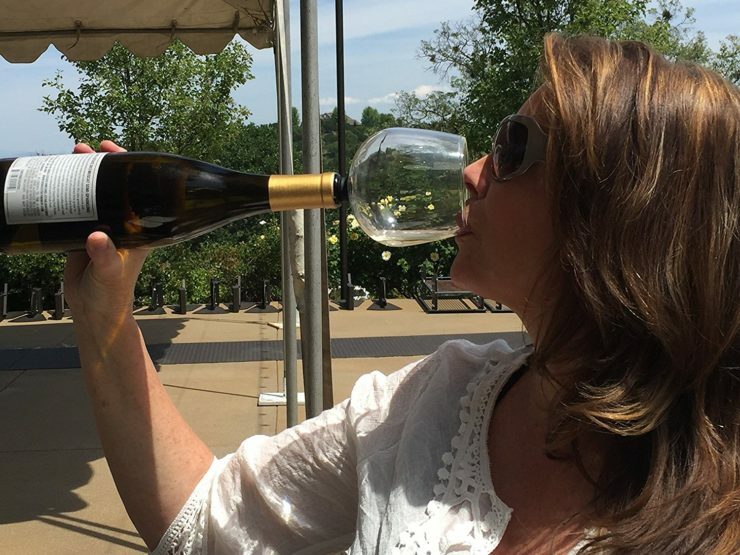 Everyone knows that if you chug wine straight from the bottle, there’s a decent chance you also might be short on manners and class. 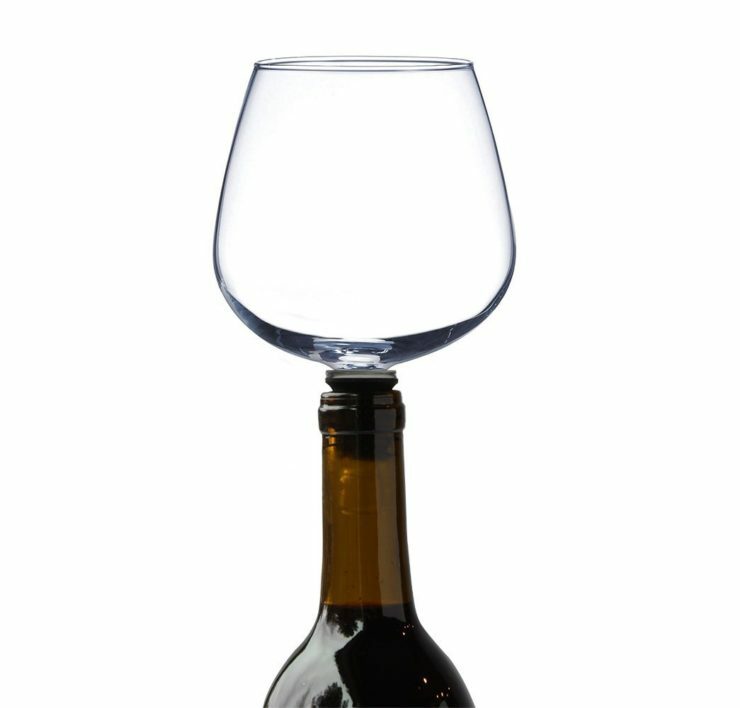 The $15 Guzzle Buddy is a wineglass-shaped attachment that plugs straight into the bottle and turns the entire thing into one giant glass. Sort of. I mean, of course it doesn’t. But you get the idea. It’s kind of like saying “Yeah, you think my drinking straight from the bottle is not classy? Well, here you go then. What now?” Yes, what now? Who’s going to say anything? No really. Now you’re all class and manners, bud. We get it. 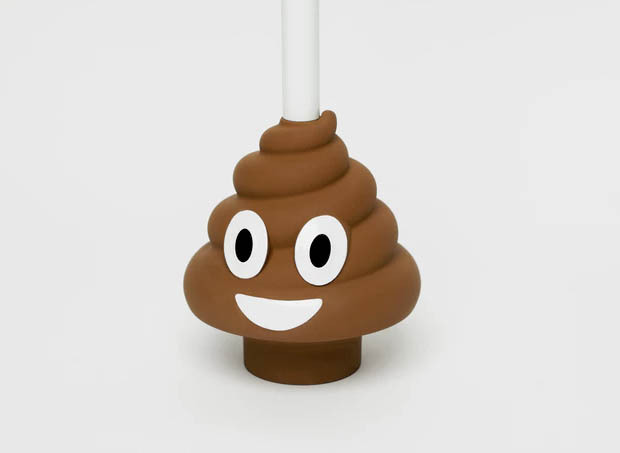 There are items in your home that exist for purely functional reasons, never being given any thoughts of aesthetics because frankly, who really cares what your toilet plunger looks like? Well, Carl Hickerson and the folks behind The Plunger Project seem to. 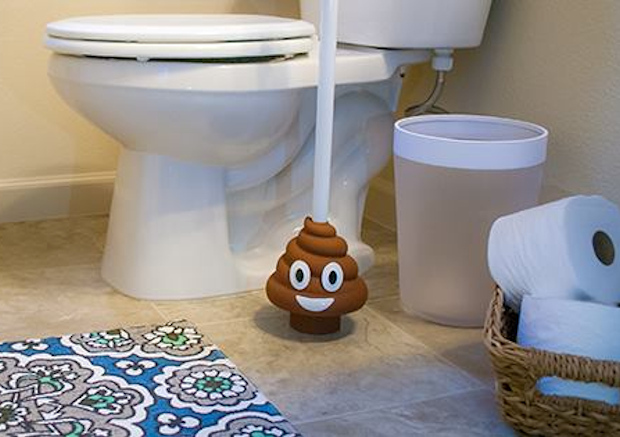 They’re launched a Kickstarter for a plunger shaped like the Poo Emoji everyone loves so much, and it’s called the Poo Plunger. There’s some peaceful beauty in a smiling poo being used to force real, less smily poo, make its way down your home’s plumbing. So kudos to them for bringing some levity to a topic most people just pretend doesn’t exist. If you want yours, you’ll have to pledge $15 and wait until October. They’re still far from reaching their goal though, with 20 days to go, so who knows if this will ever see the light of day… or the darkness of your toilet. By David Ponce on 07/05/16 • Leave a comment! If the argument over who gets to hold the remote control never ends in your household, maybe you can settle things down by relinquishing control to your dog. 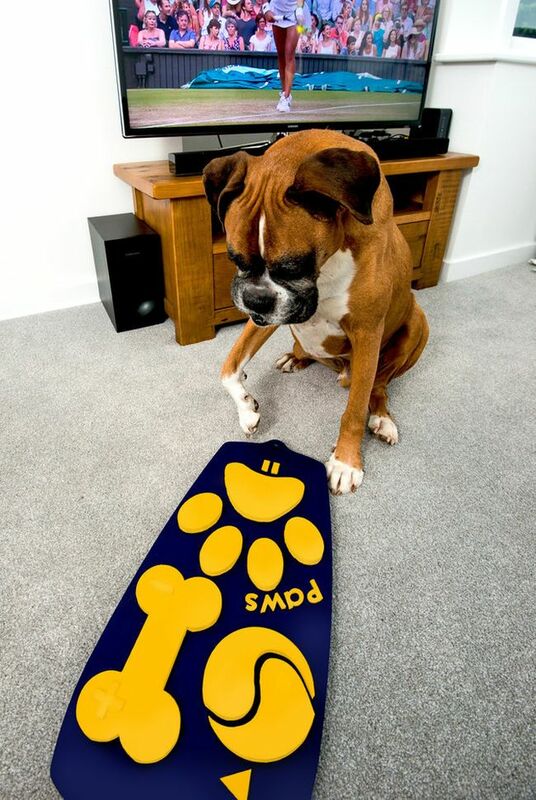 That’s right, “a researcher at in animal computer design at University of Central Lancashire collaborated with pet food brand Wagg to create the world’s first television remote just for dogs.” The device features oversized buttons, and is colored blue and yellow to accommodate your canine’s colourblindness. It’ll let your pooch channel surf while you’re away, and settle arguments when you’re not. It’s currently under development, and Wagg plans to pitch it to tech companies once it’s ready. No word on price or availability. By David Ponce on 06/28/16 • Leave a comment!